Not only will Splash Guards help protect the side of your vehicle from rock chips, they help keep it clean from mud and tar. 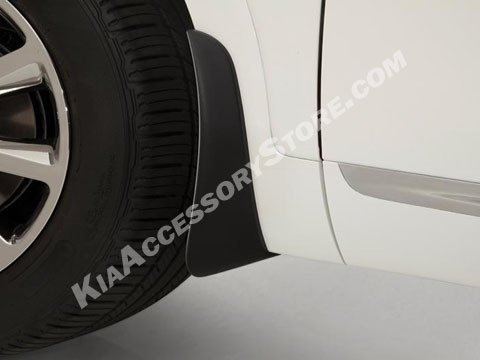 This is one of the least expensive ways to keep your Sorento looking great with our custom fitted Splash Guards. Made of ultra-durable molded black plastic. Not compatible with Side Steps. 1) Ordered all accesories for a 2016 Kia Sorento but the floor mats are not for my year and/or make Kia despite the packing sip indicating otherwise. 4) Bug deflector needs to be installed between 60 -80 degrees F. Too cold to install. Have to wait. Have some doubts as I can not find the window vent/shades anywhere. Apparently not made yet. Seems to me these would be easier to find than hood bug deflector.